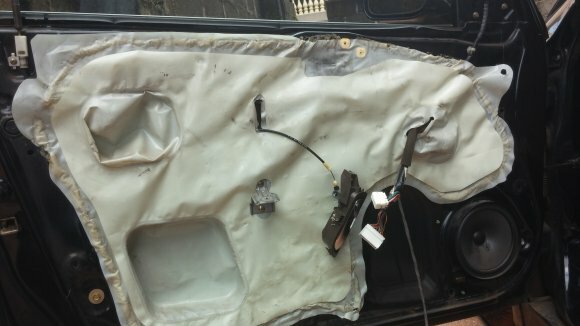 Contained herein is the step-by-step procedure for the removal of the front door drivers panel on the 2003-2007 Honda Accord. This is often required if you wish to access the front door speakers, lock mechanism etc for repairs. 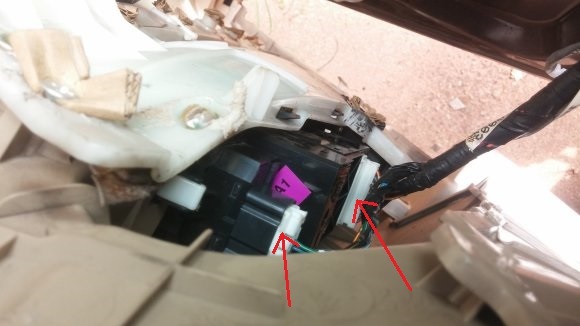 On this occasion I was replacing my ailing driver door actuator (I will detail the replacement of the driver door actuator on a different post). Materials: Screwdrivers (Philips and flat-tip) and a razor blade. 1. Using a small flat tip screwdriver, pry up the edge of the covering for the recess housing the lever for opening the door. 2. Unscrew the revealed 2 screws. 3. Pry up the rubber covering in the recess just behind the power window buttons. This will show a single screw. Remove it. 4. 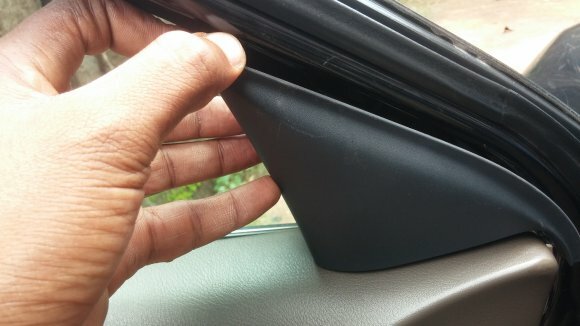 Remove this plastic covering at the upper front end of the door panel. Don’t know what its called, but would come off by slipping fingers underneath and pulling off. Its only held by plastic clips. 5. 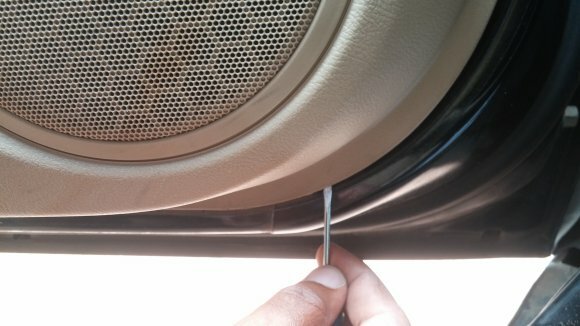 Using the tip of a flat screwdriver pry up the lower front end of the door panel. I started from just below the door speaker. 6. Once you can slip your fingers under the panel from the pried up portion, pull back. 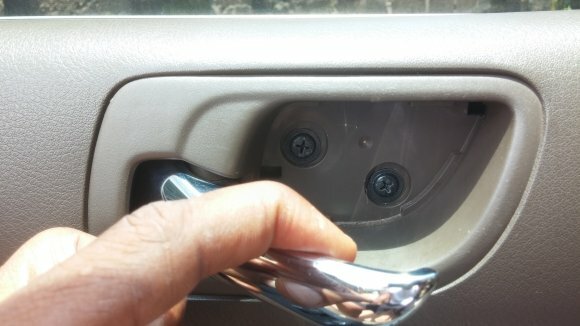 This will separate the plastic tabs holding the door panel. The panel would now be held by 4 cables which you would need to detach their connectors. You will need to suspend the hanging door panel for now until you disconnect the 4 cables. 7. From the rear aspect of the door panel, push back on the plastic housing for the driver door opening lever. This is the same part you removed 2 screws from in step two. 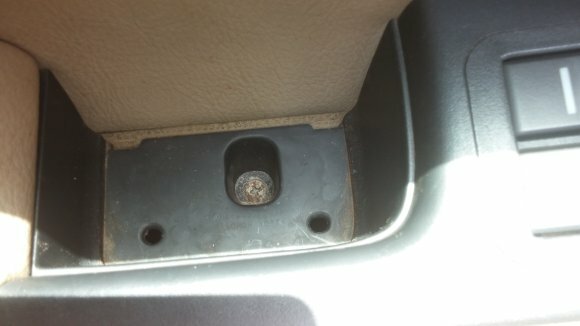 Once pushed out, slide this through the opening to the rear of the door panel. 8. 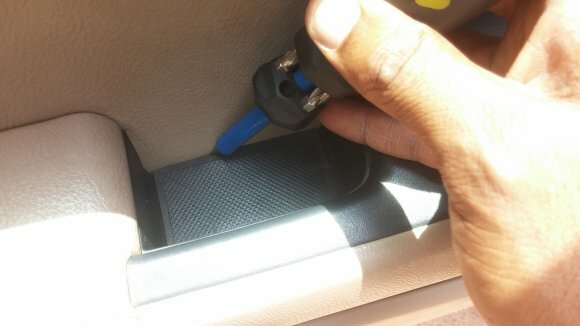 Detach the 2 electrical connectors for the side mirror adjusters and the window/lock button console. These are marked by the 2 red arrows. Both connectors have a tab to depress before removing the connector. You can turn the door panel anticlockwise to have the base rest on the ground while you do this step. Remember don’t pull on the wire itself. Pull on the white connector. 9. 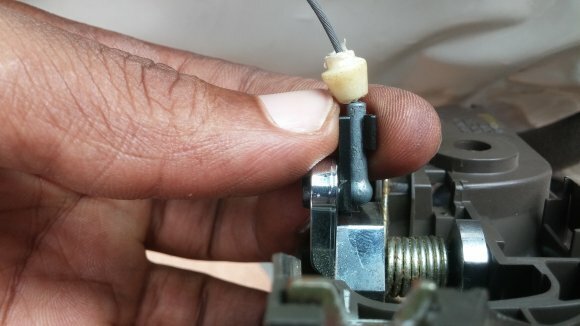 Remove the connector for the low lying door light. Its held by the grey cable shown below. 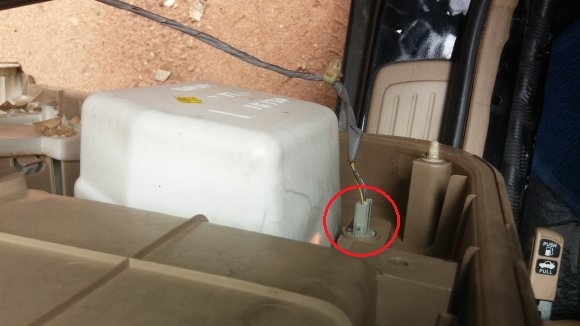 To do this, simply twist the circled part anticlockwise to free the connector. Then pull out. 10. Once the 4 cables are removed. 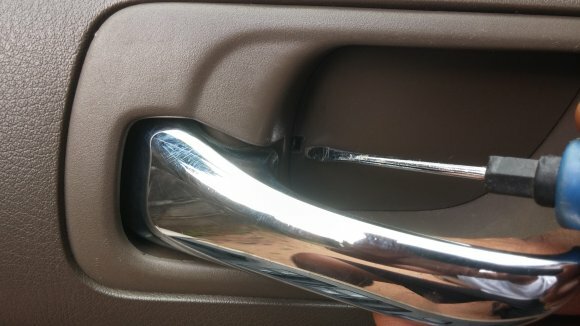 Set the door panel aside and you will have the image below. 11. Next you will need to remove the driver door opening lever mechanism (not the coolest name I admit, but it’s the bit dangling above held by the black cable). It all begins at this joint shown below. 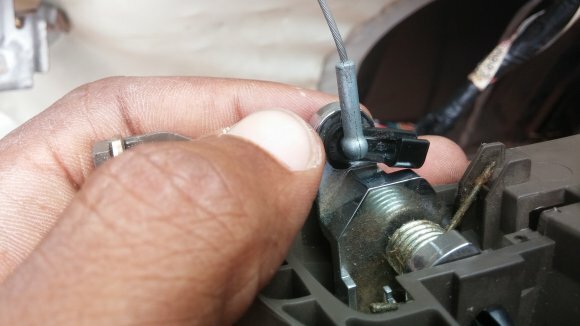 To remove this cable from the opening mechanism, the black plastic in between my fingers would need to be rolled off the grey metal in between it. 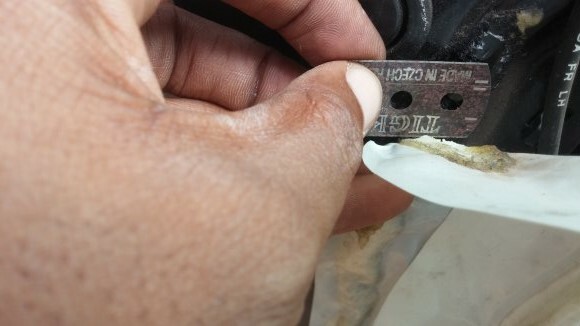 To do this, just roll back the end of the black plastic next to the tip of my index finger while pushing the grey metal out of the recess of the plastic. Once out, you will have the image below. With the black plastic removed, lift off the end of the cable. 12. Finally, to access the parts behind the door panel, you will need to peel back the water-proof covering shown in step 10. It’s held by some severely sticky gum. My technique is to peel back and divide the gummy substance with a razor blade. Some others have proposed heating this with a hair drier as it makes peeling back easier. Using the razor blade has worked very well for me. You will only peel back enough to allow you access to the part you need to get to. Hope this helps with your DIY repair! Great job – saved me a lot of time. I have a website where I documented the build of my 240Z. It costs $100/year to keep going. (http://alteredz.com). I was just thinking that if you had a “donate” button, I would donate. Maybe I will try it on my site as well. Thanks for the detailed description and pictures. Makes things very clear.